Worldwide, mosquitoes represent a far more deadly force than Al Qaeda. Mosquitoes kill and sicken millions in a typical year. Well over 3,000 known species of mosquitoes exist around the globe, including some 160 species in North America and several dozen in our southwestern desert basins and mountain ranges. Highly mobile, the mosquito, said David Smallwood in the Canadian Geographical Society Internet site, "can fly up, down, sideways and backward. Its wings beat 250 to 500 times a second, which is the source of the annoying buzz." Some species may fly for miles from their hatch sites; others, no more than a few yards. After mating, usually during spring into fall, the female mosquito seeks a meal of blood, which provides the proteins she requires to produce her eggs. Depending on her species, she lays several dozen to a couple of hundred eggs on the surface of quiet waters or on damp surfaces near standing water or intermittent streams. She may lay a single batch of eggs or numerous batches of eggs during her life cycle. Larvae hatch from the eggs within a few days with well-formed heads but no legs. They swim sinuously, like water snakes. Many species have a "respiratory siphon," which they use to breathe at the water's surface. Larvae feed on "detritus, algae, bacteria, and fungi," according to the Cornell Cooperative Extension Internet site. Some prey on other mosquito larvae. Within days, the larvae change into non-feeding pupae, which roll through water in miniature somersaults. Like the larvae, they breathe through a tube at the surface of the water. The pupae emerge as adult mosquitoes in as little as a couple of days. Both the male and female feed on plant nectar, but only the female takes blood meals – through a syringe-like proboscis – from reptiles, frogs, birds or mammals, with her species defining her choices. She selects her host on the basis of criteria such as odors emanating from the victim's breath or skin. If she is of a species that prefers mammals, she may find humans particularly enticing because we produce several hundred delectable compounds in our breath, secretions and sweat glands, said the Cornell site. 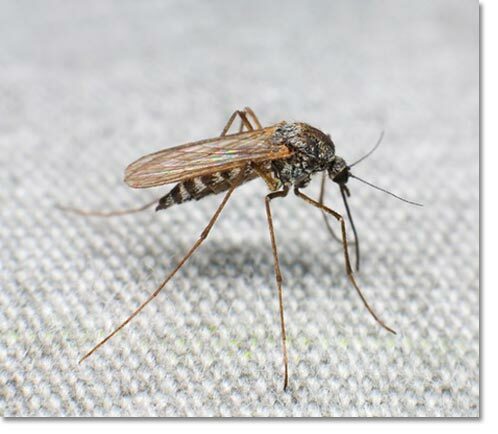 The male mosquito dies soon after mating; the female, toward the end of the warm season. Usually some of her eggs live through the winter. Mosquitoes require water for their larvae and pupae, preferably shallow quiet water that accommodates breathing at the surface and feeding on the bottom. Many mosquito species can tolerate – and may thrive – in fresh to saline water, even if it is high in organic wastes, according to the Cornell site. Throughout the Southwest, mosquitoes breed and reproduce in ponding areas, moist foliage and damp rock exposures along mountain drainages; in wetlands, back waters, lake shallows and intermittent streams within the desert river basins; and in the playa lakes of open desert grass and brushlands. They congregate and multiply in the channels, laterals and open fields of irrigated farm land and in neglected fish ponds, bird baths, fountains, gutters, swimming and wading pools, and outdoor saunas and hot tubs of our desert cities and towns. They may even appear in the flotsam and jetsam of the human community, for instance, in discarded automobiles, tires, washing machines, refrigerators, buckets, pots and cans, where water from desert thunderstorms may be trapped for some days. Heartworms to dogs, causing coughing, weight loss, physical weakness, vision loss, heart failure and, ultimately, death. Worldwide, mosquito-borne diseases such as West Nile Virus, equine encephalitis, filarial worms, malaria, yellow fever and dengue kill and sicken millions of people every year. Indeed, around the globe, as the University of California Riverside said in its Internet site, "Anywhere from 300 to 500 million cases of malaria are treated annually, according to the World Health Organization (WHO), and an estimated 1 million people die from the disease each year." In the United States, the insects began spreading WNV – the most serious mosquito-borne human health threat in our country at the present – from New York Harbor in 1999. In the Southwest, mosquitoes had begun carrying WNV into our desert basins and mountain ranges a few years later. Fortunately, only about one in five of humans infected with WNV suffer the symptoms, which can include fever, nausea, headaches and body aches that may last from days to weeks. About one in 150 develops more severe symptoms, which may include high fever, tremors, convulsion, vision loss, numbness and paralysis, with neurological effects that can become permanent. Avoiding Mosquito Bites and Treating Mosquito Bites.